I have a complete set of Ping Eye 2 Irons and I believe that you will find that they are very forgiving and competative with today's clubs. They do not have a huge head but the 1 and 2 irons are as easy to hit as the three iron, mainly because they do not lose any size of the head. The sand wedges are well designed and work well out of the bunkers and around the greens. Even in hard packed sand, I was able to get the ball up and out without scalding the ball across the green. I enjoy my Ping Eye 2 irons and would recommend them. If you cant hit them, the flaw is your golf swing and not clubs. Too many people beleive techology will save them, when in actuality, no club will fix poor mechanics. Find yourself any Ping Eye 2 club and you will be happy, I know I am. Why buy a hybrid if you can hit a one iron. Karsten got it right years ago when they produced the Eye 2 One Iron. Club sets up well and is amazingly easy to hit. Much more versatile than the run of the mill hybrid. I've used a one iron for years and found the Eye 2 instills confidence when trying to hit the tight left pin on a water guarded 230 yard par 3. The Ping can also keep you in the narrow fairways when accuracy is vital; all the while maintaining more than sufficient distance to hit any par 4 in regulation. The best thing about having an Eye 2 one iron is telling your golfing buddies. "Yeah, I still hit a knife." If possible I would leave negative stars rating. 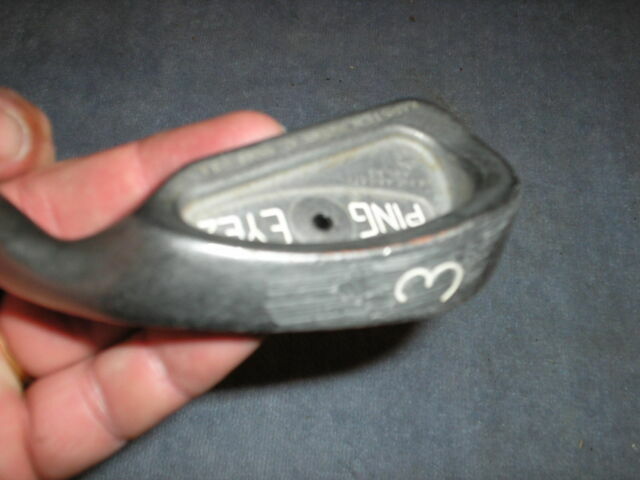 Yes, seller did provide pictures of item, in this case a golf club 9 iron and he described it as 36 inches BUT..... failed to mention the club was in two (2) pieces and never showed pictures of a whole club.